No instruments, no music lessons, just three voices and local jazz inspiration. Rhythmic and perfectly harmonised, South Africa's up-and-coming vocal trio The Soil promise to be the 21st century's answer to their countrymen Ladysmith Black Mambazo, though none of them can read a note of music. Running fast in the tracks of their forerunners, this next generation of township a capella bring their laid-back fusion of hip-hop, soul, jazz and afropop for the first time to the 15th Cape Town International Jazz Festival, which starts Friday. No instruments, no music lessons, just three voices and local jazz inspiration, because that's all these 20-somethings had during their childhood in Soweto, Johannesburg's world-famous former blacks-only suburb. "Growing up in Soweto, you can't just find a house with a piano, it's very rare to find a home with a set of drums sitting there," said Buhle Mda, 26, the group's only woman member. "You just use what you have," she added, sporting vivacious bright red lipstick and black thick-rimmed glasses. Luphindo "Master P" Ngxanga, 27, is the human beatbox, pumping out the rhythms with his mouth while playing air guitar -- bass guitar, to be exact. 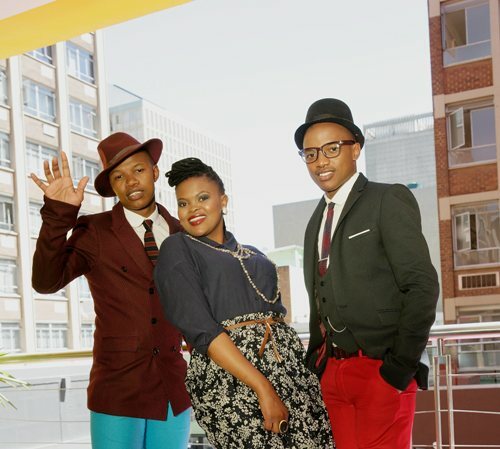 His 25-year-old brother, Ntsika, joins Buhle on vocals to complete the trio. Their sound is modern with traditional influences, their look cheeky and confidently urbane, reaching far beyond their native Soweto. They write the lyrics together -- "Majority rules!" said Buhle -- in English and Xhosa, and tell the story of life in a country where most people are under 25 years old and many don't have work. "One percent fantasy and 99 percent reality", they touch on love, family, and community. "We sing about daily occurrences, and living in South Africa. You get exposed to politics, to whatever, to love and things like that," said Buhle. "Maybe we sing about poverty and how it has struck our communities, and we bring hope from those sad stories." "And when it comes to those love songs we joke about things," explained Ntsika. "And we take from experiences that maybe Buhle went through and Master P over there, or myself and we just make the song of that." "And people relate to that kind of music." They have gone a far way in a short time, received with fanfare at New York's Apollo Theatre and last year's Edinburgh International Festival. But it all started 10 years ago, at their high school music group. "We would have musical sessions that looked more like poetry sessions at times. At times it also looked like rap sessions, but those sessions became more musical" remembered Ntsika. By 2005 they started taking music more seriously and soon built up a repertoire of 10 songs. Almost a decade later they sport a double platinum album -- more than 100,000 sales -- hundreds of thousands of fans, and a prime spot at one of Africa's largest jazz festivals. "From the moment we started singing, forming this group, we had a list of places we would like to perform at, and that the Cape Town Jazz Festival has always been in that top five," said an upbeat Ntsika. "So we are geared up and ready for it, we cannot even contain our excitement!" Stretching over two days, the festival will host over 40 acts from around the world, including America's acclaimed Erykah Badu. A remaining dream is to perform with Joseph Shabalala, the 73-year-old founder of mult-Grammy winners Ladysmith Black Mambazo, and emulate his achievements. "His music and the rest of the Mambazo has been a very big influence on our music as well as music from different artists in South Africa," said Buhle. "And the basis of the music, we all know, it's a capella. We all choose to stick to it." "The thing that we like about Mambazo is that they choose to stick to it and they were never ashamed to perform all their songs in Zulu abroad, but still to be able to touch people's soul, in different ways," she continued. "And we hope to do that with our music as well."